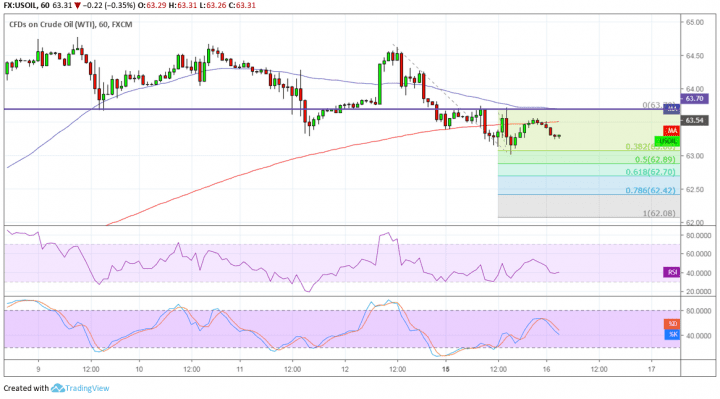 WTI crude oil recently broke below support around the $63.60 per barrel mark to signal that bears are gaining the upper hand. Price also seems to have completed a quick pullback to this region to confirm that the selloff could resume from here. Applying the Fib extension tool shows the next potential downside targets. Price has some room to go before testing the 38.2% level around $63 per barrel but could still head to the next levels if selling pressure persists. The full extension is close to the $62 per barrel level. The 100 SMA is above the longer-term 200 SMA for now, but the gap has narrowed enough to signal weakening bullish momentum and a possible bearish crossover. In that case, selling pressure could keep picking up, especially with price treating the 200 SMA as dynamic resistance on the latest pullback. RSI is on middle ground but is pointing down to signal a bit of bearish pressure. Stochastic is also moving lower without hitting the overbought region, indicating that sellers are eager to return. Crude oil took hits on Russia’s move to question output cuts by the OPEC, citing that they might boost production later on in order to fight for market share with the US. Recall that the OPEC production agreement has been mostly responsible for keeping crude oil prices afloat in the past months, along with US sanctions on Venezuela. “There is a dilemma. What should we do with OPEC: should we lose the market, which is being occupied by the Americans, or quit the deal?